Our Classic Facials are a great way for both men & woman to hydrate the skin, clean deep into the pores, stimulate cell renewal and help reverse the signs of aging. Our aestheticians have as much product and ingredient compound training than just about anybody. Each facial at O U Beauty is customized to suit your skin type whether oily, dry, sensitive, acneic, for all skin colors and ethnicities. We do not believe in the “one size fits all” facial. At O U Beauty, it’s about you and your skin. 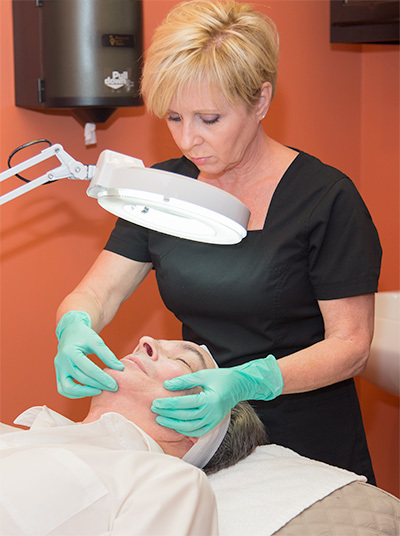 Stimulate collagen and elastin with this beautiful anti-aging facial that includes TNS® Growth Factor. Tightens skin, smooths fine lines and wrinkles and improves tone and texture. Provides immediate gratification and skin- perfecting results. Ultra hydrating and designed to brighten and tighten skin leaving you picture perfect for any occasion with SkinMedica® Illuminize Peel. Our calming green tea and chamomile masque will restore balance to the skin. Perfect for the most sensitive skins, including Rosacea. Drenches skin with SkinMedica® HA5 Hyaluronic Acid. Smooths fine lines and wrinkles, provides immediate hydration and improves skin texture. Supercharge your skin by combining a microderm with our Deep Pore Cleanse. Wonderful for dull skin, enlarged pores, mild acne scars and uneven pigmentation. Well suited for those prone to acne or excessive oil production. The PCA® Detox Gel deep cleanses the pores and leaves skin refreshed and glowing. This specialized facial for a man’s skin incorporates deep cleansing, exfoliation and hydration. Effectively reduces pore size and shaving irritability. How can I get more information face to face? You can schedule a free consultation at OU Beauty Medical Spa by calling 818.551.1682 (818.55-11-OUB).